EFFECTIVE - The most effective way to potty train your dog, whether it is a new dog or puppy this will get your dog communicating without barking, scratching or whining. EXTRA LOUD BELLS - Our bells are loud and can be heard throughout your home. You can use this door and NEVER miss your dog and when they need to go outside. FREE BONUS INSTRUCTIONS eBook (SENT BY EMAIL) - Included with this purchase is an eBook which with a few steps breaks down any difficulty with training your dog to communicate with you. BUY WITH CONFIDENCE - As with all our products, all of our premium products have a 100% Lifetime Money Back Guarantee meaning you never need to worry! Are You Sick of your Dog Barking to Go Outside? Is Your Dog constantly scratching the door to go outside? Are you Housebreaking or Housetraining a new dog or puppy/puppies? Annoyed due to the mess and smell your dog keeps making inside your home? With our Dog Doorbells, you can train your dog easily to communicate effectively. Save money on wipes, sprays, deodorizers and other cleaning products by using our bestselling potty bells to train your dog at home. 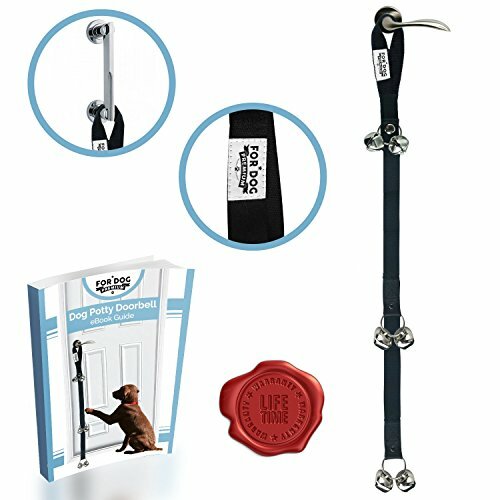 What makes the For Dog Premium Dog Doorbells unique? We know about dogs; it is our business after all. Our Dog Door Potty Bells are made of quality durable nylon material and can used on all door types including knobs, handles and hooks. The bells included are made using strong and loud metals, which means you should NEVER miss a thing. Our FREE BONUS Instructions manual should help you get your dog trained to communicate with you with a few simple but effective steps. REMEMBER this is a premium product available NOW at an affordable price, we cannot guarantee stock or prices. CLICK BUY NOW to avoid missing out! PLEASE NOTE: The FREE eBook is sent by email within 1 hour of purchase. If for whatever reason you have NOT received your eBook, contact us and we will send you a FREE replacement copy.